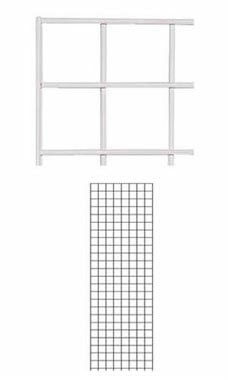 Sell your product line with ease using these White Wire Grid Panels! Measuring 2' x 6', these panels can easily display almost any size item. The beautiful white finish that this panel comes in looks great and will attract many more customers and keep them interested. The panel features sturdy wires spaced 3" on the center and comes complete with double wires along the outside of the panel, which provides extra support. Must be ordered in increments of 2 panels, due to the packaging and shipping of the panels. In stock and available for immediate shipment. These grid panels are great. The white is nice because the panel will stay in the background when product is mounted. They are heavy duty and will hold a lot of product. These panels are the perfect size and work great as freestanding displays when connected together. They are perfect for displaying items. We have ordered grid panels and accessories for them, shipments are always fast and customer service is awesome, I will always buy from this company just for the great service not to mention great prices! I love the grid wall panels! I have purchased several of these panels in several different sizes to use at craft shows. They are easy to assemble and are versatile enough to be set up in endless configurations for any venue. They are very sturdy & have a lot of room to hold merchandise. I ordered these initially because I didn't have a lot to spend on displays. I go to different arts and crafts shows. These are light enough that I can carry them, nice quality, and they are so easy to store. Love my new display! I purchased these to be able to transport them to craft shows. At the craft shows they work perfectly for displaying my items. They are sturdy and really do hold a lot of product. When I got home I realized that these would work for more than just the craft shows. When I am not using them to sale my items they are set up in my home studio helping me keep my inventory in check and organized. Thank you so much - I LOVE THESE!!! This was just what I needed. I came packaged nicely. Delivery was quick. The grid hs helped to organize and clearly display merchandise. speedy delivery as promised. Easy to handle and set up. Super fast shipping. The white wire grid panel looks great in my store. I installed it up high to make space that is normally not usable now usable. Simplified the display area for our pro shop. Sturdy, attractive, easy to install. Fast delivery.